Cost is always an important part of a project. The finish materials selected will determine the final cost. My wide range of product suppliers helps me keep my clients budget on track. I would be delighted to share my years of experience with you. We create kitchen and bathrooms specifically tailored to the work and lifestyle of our clients. We do it efficiently and cost-effectively, from schematic plans to the final installation. We combine form and function, with a design awareness to compliment the personal expression and taste of each individual. Whether you prefer a traditional look or a modern design, we will create an environment you will enjoy for many years to come. We worked with Mary on our kitchen remodel this year. She created all the plans and budget for the project. She designed the space and did a wonderful job. The plan uses every square inch in the best way. We are very pleased with the design and all her recommendations for finishes. Thank you Adriane, it has been a pleasure to work with you. Thank you for asking me to help with the bathroom design too. 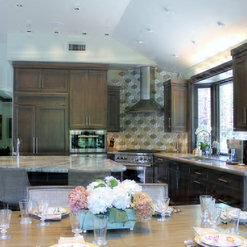 I highly recommend MDB Design Group when considering a kitchen redesign. Mary was courteous and creative. 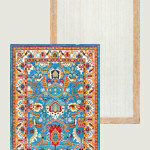 She considered all our needs and develop concepts that were stylish yet functional for our family. Mary was available and attentive to our needs. We live in Altadena, so it was a pleasure to work with a designer local to Pasadena and Altadena area. We love our new kitchen - it's where we hang out as a family in the mornings and for homework each night. Thank you for writing a review for MDB Design Group. I enjoyed working with you and your family very much. I love the kitchen too. I hope you and your family the best. Mary at MDB designs is a very creative and knowledgeable designer who pays attention to details. She made sure that storage and accessibility in my kitchen were met. 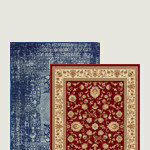 Also she strives to give her customers the very best quality at an affordable price within the budget. I was happy and fortunate to have her help. I HIGHLY recommend MDB if you want a designer who has integrity and honesty. Thank you for writing a nice note. 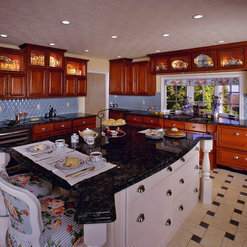 I have enjoyed working with you and I am very happy that you love the kitchen remodel in every way. We have typically designed and managed our own remodel work, but found ourselves facing a remodel in a new neighborhood far from our trusted resources and contractors so we decided to hire a designer. From our first meeting with Mary, we were sure that she really knew her stuff and that she would be a pleasure with which to work. Our project included a partial kitchen remodel to improve the functionality and finishes, the addition of a pantry in an unused closet adjacent to the kitchen, a full/down-to-the-studs remodel of our main bathroom, and a cosmetic makeover of the great room including refinished floors, carpentry work and new drywall/paint. It was important to us to maintain the mid-century character of our home without losing our personal aesthetic in the process. 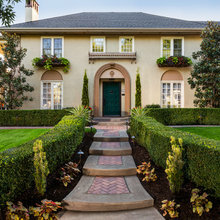 We also encountered several challenges which are typical when dealing with an older home. Mary was adept at providing creative solutions and many options from which to choose. Mary assisted us in the selection of a project manager and the various subcontractors and made the process of choosing designs and finishes very easy. She has a wealth of contacts for just about anything that you could possibly need to complete your project. Mary is always prompt for scheduled meetings, makes time to come to the job site as needed and is responsive via email, phone and text. She is also mindful of the budget and project schedule. She even went the extra mile to help me validate furnishing choices as the project came to a close. We are so pleased with the results and will be contacting Mary again when it is time to tackle other parts of our house. I enjoyed working with you and creating a unifying design to pull the rooms together, while making them function for you. Thank you for the detailed review. Mary at MDB Design has been a true pleasure to work with! 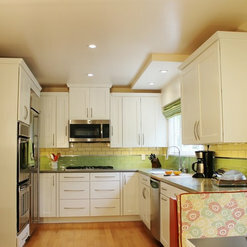 We are extremely happy with our newly renovated kitchen, laundry room and breakfast nook. Whenever there was a challenge with our project she was available and we relied on her experience and judgment. We are lucky to have had her expertise and we would recommend her to all our family and friends. Thank you both for this review. It has been a great pleasure to work with you and to see the transformation of the spaces. I am glad you are happy with the results. We hired Mary/MDB Design group to assist with a major remodel of our master bathroom. 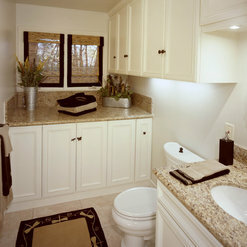 Based on her work with the first bathroom we also hired her for a smaller scale guest bathroom. Mary patiently guided us through each project as she assisted in making all the design choices. She listened carefully to our vision and gave us options in how to carry that through to design. She answered every question, addressed every concern, and was always available to meet with us to review progress. With any project there are inevitably bumps in the road along the way. Mary was tenacious in dealing with any challenge that arose. Overall she is professional and attentive to every need and detail. It is with pleasure that we recommend MDB Design Group to bring your project from a vision to an updated, much improved living space. It was a pleasure to work with you and your husband. The completed bath is beautiful and functional. Thank you for allowing me to provide planning and design services that helped you to achieve your goal. We hired MDB design to help us with an extensive remodel of the kitchen, dining area, and living room. We tore out everything back to the studs, upgraded the insulation, installed new tile flooring, cabinets, and appliances. Mary was on site everyday and kept the process moving even when the unexpected problems popped up. We are very pleased with our upgrade. 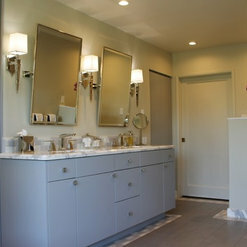 Mary at MDB Design Group did a wonderful job on the remodel of two, dated bathrooms in my home. She considered the space, my lifestyle, my budget, and my taste in designing and selecting the materials for both baths (master and guest). She made suggestions that saved me money but also advised when she felt a slight budget stretch would improve my home's value as well as my happiness with the result over the long term. She was deft at managing expectations in light of the budget. I LOVED the contractors she provided; they were a pleasure to work with and consummate professionals. I'm absolutely delighted with the results! Mary is a pleasure to work with. I recommend her highly! Working with the MDB Design Group was a pleasure. Specifically, Mary Broerman was attentive, courteous and full of ideas. She always listened and came forth with the kind of ideas that made sense to our vision. But she also would work in a gentile way to expand our horizons and think outside the box. Once the planning stage got into full swing, Mary would present professional drawings and then, if we couldn't visualize a detail, get down on the floor and draw it out in living scale. My wife loved working with her too. 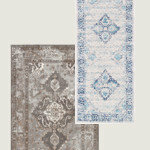 Selecting stone, tile, furniture, colors, patterns and you name it, Mary was always right-on! In the end, the kitchen, dining area and family room came together perfectly. You may have guessed it, we are happy with the MDB Design Group and recommend them every chance we get! 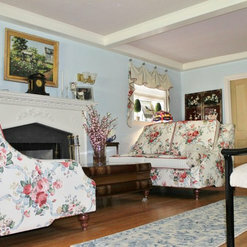 Mary provided design services for us during a fairly large remodel of our kitchen and family room. She was excellent. Mary did not just help choose materials; she helped design layout and got down on hands and knees to measure and mark the layout our cabinets and island so we could better visualize the possibilities. She has great taste but was not at all pushing her style, rather she encouraged all ideas that we came up with and would help us to make them work. Mary was very almost always available when we needed her; she would even come over on Sundays to accommodate our schedule. We absolutely love our new space and everything in it that she helped us with! We remodeled our 1929 kitchen and laundry room, upgrading it from a very dated, old 1970's remodel to a clean modern semi-Deco design. We replaced and reconfigured all lower cabinets adding large storage drawers and corner "lazy susan" storage configuration; finished and added new doors to upper cabinets. All drawers and cabinets have the auto-close feature. An older ceiling was removed and the original ceiling, 8" higher, was rehabilitated along with some ceiling plumbing relocation. Additionally, we changed out the sink, faucet and other items. 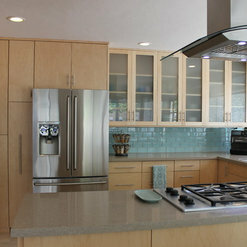 A new convection microwave was installed over the original stainless steel cooktop adding utility to kitchen capacity. The original stainless steel side-by-side refrigerator, double oven and dishwasher remained with the kitchen. The walls were painted a pale peach color with new celery green glass and butter cream subway tile added to compliment the medium gray countertops. The countertop color sits well with the stainless steel appliances and ties together all the kitchen design elements. 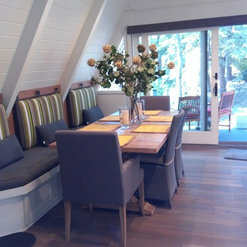 We also upgraded the small kitchen dining area to very versatile breakfast and lunch seating with under-seat storage area. The laundry room was repurposed with the removal of an old utility sink and a redesign that incorporated a full size, stacked washer and dryer as well as a second "party" refrigerator. New upper and lower cabinetry, along with new drawers and counter top add utility to the laundry area. 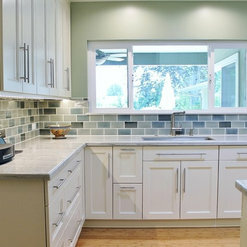 The countertops are also lined with a single row of the same green glass subway tiles as in the kitchen. 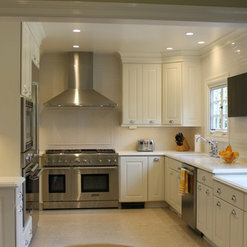 The final kitchen and laundry design is wonderful and upgraded the 1929 house dramatically. Great design support and follow up. The designer managed the schedule of the workers so that we proceeded along with minor delays other than the usual "unanticipated" changes. 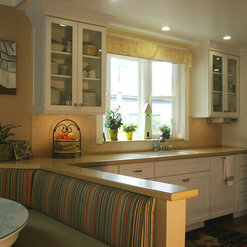 We are very happy with the design and the kitchen and would recommend Mary to anyone who needs home remodeling. This was a challenging kitchen to accomplish all the aspects described. As you can see it all came together and we created a functional and fun space to be in at any time of the day. They were a great couple to work with. It was my pleasure to help them achieve their goals for their home. 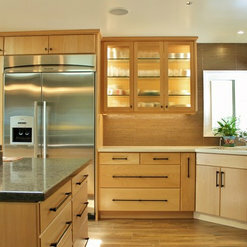 Commented: what floor material is in this kitchen?cork planks from AM Cork in Texas. Commented: can you give approximate dimensions of this room. TaIt has been awhile but I think it was a little over six feet in width by about 11 feet. 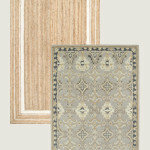 I suggest you measure he components and see how they will fit in your space. Commented: Color do counterCeasarstone #4230 Shitake.